Solawrap Films + Britespan Commerical Greenhouse- Snow Load Holding Power- Best cold Weather Structure With SolaWrap! Where can you buy a greenhouse that is made for our climate? Here! 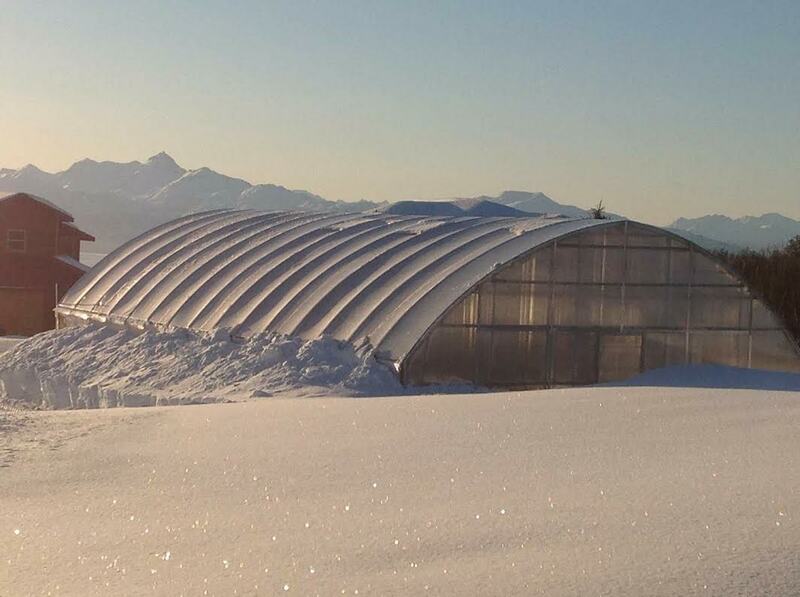 Snow Load is No Match For the Solawrap/Britespan Commercial Greenhouse- The Dynamic Duo! Solawrap greenhouse plastic is a clear plastic film that has a track record for withstanding heavy snow loads**- 120 LBS per square foot of snow. That equates to 15 feet of snow! Traditional greenhouse structures can't withstand the same harsh conditions as SolaWrap, so this is the perfect marriage. Traditional greenhouses usually have maximum widths of 30-40' before they need to have supporting interior structure. Britespan can go 300' wide with no interior supports needed. All space can be utilized as effectively as possible. (Note that Britespan greenhouses are used by commercial and residential growers). Britespan HAS NO GUTTERS- it is a clear span structure which allows for more grow space! Britespan greenhouse structures are specifically engineered to your site, your wind and snow loads . What differentiates Britespan is the process they use with the steel that is used to make the structure. Britespan greenhouses are made with hot dipped galvanized steel trusses, which offer lifelong corrosion protection and a much longer service life. Read an article about greenhouses and snow in Greenhouse Grower Magazine. Aren't all steel greenhouse structures essentially the same? Do you want a kit for simplicity instead? Please look here! NO! The difference is in the steel and in the greenhouse plastic covering! Below is regular greenhouse covered in SolaWrap in Ishpeming, Michigan. Snowfall is 161 inches. The average US city gets 26 inches of snow per year. The number of days with any measurable precipitation is 83. On average, there are 184 sunny days per year in Ishpeming, Michigan. Not all galvanizing is the same. There are two different types of galvanized pipe: in-line (triple coat/Gatorshield or pre-galvanized) and post production hot dipped galvanized. While both use zinc coating, the application is the most critical part. Britespan applies hot dipped galvanizing to all of their trusses post production (after all fabrication is complete), which uses an entirely different process to ensure lifelong corrosion protection and a much longer service life. Britespan starts with untreated black structural steel. We bend and weld the raw steel into our trusses. Holes are drilled into the pipe to ensure the galvanizing reaches every surface. After that, the trusses are submerged in a bath of molten zinc where they receive a coating on every surface inside and out that is three times thicker than the coating on the outside of in-line galvanized pipe. This process means that your building will offer a service life that is approximately three times longer than the in-line galvanized alternative. In-line galvanized pipe is rolled through a waterfall of zinc and the pipe is coated on the outside, painted on the inside, and is then sent out to be manufactured. The pipe is bent, welded into trusses, and shipped out. Unfortunately, the welding of the trusses burns off the paint on the inside of the pipe, leaving it unprotected and susceptible to rust before it ever gets erected. The engineered Britespan building you are quoted up front will withstand the conditions of the site to which it has been engineered without all of the surprise price increases. Supplying strong, safe and reliable buildings is a top priority for us when we design and engineer our buildings. Britespan incorporates all of the critical design factors into our buildings so you do not have to worry about your building’s safety. When the next storm hits, don't loose sleep or your crops- build a Solawrap Britespan Greenhouse! Curious to know how much a Solawrap Britespan greenhouse will cost? Please click on the button below for further information. ** How much does snow weigh (Snow load)? Structural engineers use building codes to determine snow loads on greenhouse structures that are custom designed for the exact location where they will be erected. Currently, the International Building Code or IBC is used in the United States for snow loads. It is up to the sates and/or local jurisdictions to amend or supplement the IBC, or adopt their own code. The building code identifies the ground snow load, which building designers use as the starting point to calculate the uniform design snow load on a building roof. What is Ground Snow vs Roof Snow? "Ground snow load is defined as the weight of snow on the ground surface. Ground snow load values are established using data collected by the National Weather Service. Maps of ground snow loads in IBC and in ASCE 7 indicate a 2 percent probability of the indicated load being equaled or exceeded in any given year. Ground snow loads do not discount that actual snow loads may exceed them, only that the risk of snow-load-induced failure is reduced to an acceptably low level." When it comes to snow load, what weighs more Ice or Snow? Ice does. One inch of ice weighs a little less than 5 pounds per square foot, and 1 foot of ice weighs approximately 57 pounds per square foot. Ice weighs significantly more than heavy, wet snow per inch depth. In part, this is why it is important to prevent ice buildup on a roof structure. There are so many factors to take into consideration when you are planning for a greenhouse. Let our engineers help you build the greenhouse that will let you sleep at night during a heavy storm. Do you have a Fabric Structure Question? Looking for a Britespan Dealer In the USA or Southern California??!! !